Works Cited: An Alphabetical Odyssey of Mayhem and Misbehavior by Brandon R. Schrand. University of Nebraska Press/Bison Books, 224 pp. My summer’s most happy reading surprise was Works Cited, a well-written memoir with a structure both clever and pleasing. 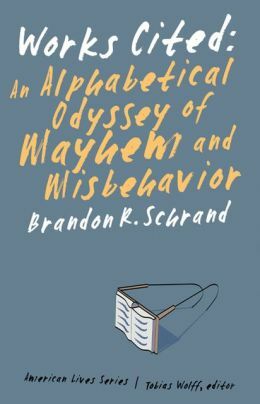 Brandon Schrand hit upon the idea to tell his coming-of-age story by listing alphabetically the authors he was reading as he came to manhood, from high school through graduate school. You know, like an MLA Works Cited list. What might have been a story too mundane or too urgent with authorial desire to move us emotionally becomes, instead, a truly affecting stealth memoir by a guy who knows he escaped his fate by the skin of his teeth. All you really need to know about Schrand, who grew up in the working-class sticks in Idaho, is that his stoner-electrician father’s nickname for him was “Bird-Turd.” He was a goofy kid, a heavy metal punk, and an awful student. But he had one great asset that saved him: he was a reader. Although he blew off assigned books, even in college, from which he dropped out and had to fight his way back, he kept finding great books and reading them. His priorities were often wrong, but they were pure. Who was that young man in that coffee shop that afternoon, and what was he feeling? A strange creature, lean and quiet, he is apologetic in his countenance. It’s a tricky business cracking open our younger selves for a peek inside, especially in vulnerable moments . . . There I sat, broke, with a copy of Hemingway’s stories. The college flunky. The dropout. It’s a wonder I bought the book at all. It’s a wonder I took the time to read it. It’s a wonder how I fell into those pages. But I did. First in that coffee shop, and then in the days and weeks and months and years that came afterward. Today he’s a creative writing professor at the University of Idaho. I’m looking forward to reading his first memoir, The Enders Hotel, about living for a time in a rundown hotel that his family ran in Soda Springs, Idaho. In Works Cited I got so into Schrand’s story—his herky-jerky academic progress, his drinking and substance abuse issues, his relationships, his writing apprenticeship—that at times I was jarred by finding myself in an earlier time frame. Then I had to recall his structure: just because he’s made it to graduate school, not every author significant to him will be from that time; sometimes, as in life, we find something has thrown us back into high school hell. “Brandon Schrand hit upon the idea to tell his coming-of-age story by listing alphabetically the authors he was reading as he came to manhood, from high school through graduate school.” Good Lord, this struck me as astonishing. I read a lot growing up . . . but a list? Schrand’s writing style is engaging in the paragraph you quoted. Looks like another good one for the queue. Get your list together, Beth! Methinks he artfully edited his list—at least I hope so. It’s funny, I just started keeping a list of books I’ve read. And so far I’ve been honest, treating it as a kind of diary or profile of me at the time. Who knows what, if anything, will come back when and if I revisit my list? And like you, I have lists of books to read, but seldom consult them! Wow. What a brilliant idea. My husband is a theatre person and playwright. He has saved every program from every play he has ever seen. I call them his journals. T’would make an interesting play. And I’m immersed now in trying to tell my story behind my story (thanks for that suggestion–and I’m saying that entirely without irony; okay, maybe with a hint of irony). I just finished the first post today, which is an outline (for me, at least) of something like, oh, maybe 100 more? I mean, how does one tell the story behind the story of what compels a person to write. In my haste to economize words, I forgot the word succinctly. How to tell the story succinctly? For a blog! Thanks a lot. (Really, it was a very good idea; it fueled my inspiration). Tracy, I am definitely NOT the go-to guy on succinct! However, I am making an effort, and this post is Exhibit A. One thing that helped is that I did not review the book right away, just let it marinate, and what was left were a few main points. I guess that might be your answer, too; you have written the book and may have some distance and can summarize. This memoir looks to be an interesting read. Thanks for the review, Richard. Dubus & Russo wonder: Why Memoir?